(yWeekend) Four undercover persons investigate wages at foreign fast food restaurants for <New Express>. By Xu Ying (徐英). April 5, 2007. As of April 3, the Guangdong provincial Labor Supervisory Department has not announced the results of the investigation of the "alleged illegal labor practices at McDonald's and KFC." On March 28, the Guangzhou <New Express> newspaper reported that one of their reporters and three interns went undercover to work at McDonald's, KFC and Pizza Hut and earned hourly wages that were lower than the minimum standard for part-time workers as stipulated by the regulations of Guangzhou city. <New Express> reporters Wang Huaping and Bu Fan were involved in that investigation, and they told our reporter how their undercover work obtained the key evidence and then they went to the Labor Supervisory Department. Wang Huaping said: "These foreign restaurant enterprises may have an attractive exterior appearance, but they are really sweat factories. They paid their workers 200 million RMB less each year, and that is equivalent to their entire tax bill in China." Afterwards, the media everywhere followed up on the alleged illegal labor practices of the foreign fast food restaurants. 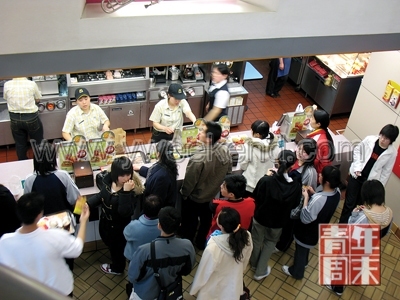 The Guangdong provincial Labor Protection Department and the National Labor Federation quickly joined in the investigation of labor practices at foreign fast food restaurants. The following is the account by reporter Wang Huaping (王华平). After the Lunar New Year passed, I received a telephone call from two current university students to say that they have been working part-time at McDonald's for more than one year and they were just making 4 RMB per hour. That is lower than the Guangzhou city requirement of 7.5 RMB per hour. I asked to meet with them, but they declined. They were angry at what McDonald's was doing, but they did not want to lose their jobs. Fortunately, a female intern at the newspaper has a younger sister attending that university. Through this connection, the two university students agreed to a meeting at a restaurant near the university. "We want to verify whether you are working part-time at McDonald's and just what they are paying you per hour." They were hesitant. Then we promised that we would not divulge their identities, and then they showed us their work cards for verification. They had been working at McDonald's for more than one year, but they did not have any contracts. Without a contract with McDonald's, there is a big risk in reporting the case in the newspaper. So we decided to conduct an undercover investigation. The undercover investigation was assigned to three interns. McDonald's and KFC were hiring university students. If the reporter takes a fake student identification to apply for a job and gets accepted, this is deception. But our interns are university students, so there is no controversy. Besides, people are usually not on guard against female students. Before the investigation began, we brought them to more than a dozen McDonald's and KFC in Guangzhou, Dongguan and Shenzhen. At each place, they asked whether the place was hiring and what the wages were. The response was: "Apply for the job first." Anyway, I let them fill out the applications. Whosoever responds, they will go there. On the day after intern Wu Shuyan filled out an application, the KFC at Saibo called to ask her to interview. All three interns were hired by McDonald's or KFC. Half a month later, none of them received a contact. On the afternoon of February 8, I was gathering news outside. My mobile telephone rang and it was intern Zhang Miaomiao working at the Baoshan McDonald's. "I got a contact!" She sounded ecstatic over the telephone. Based upon our plan, the intern will demand a contract from the manager as soon as they start working. Zhang Miaomiao did that. At first, the manager kept saying "in a couple of days" to delay it. After two days, she went back to the manager again. He said "in a couple of days" again. She was worried and asked me what she should do. "You bluff him. You tell him: If I don't get a contract, I will leave. I came from outside Guangzhou. My family will ask me what I'm doing in Guangzhou. I have no explanation. They will wonder if I am doing bad things on the outside ..." I told her to do that. So the manager ultimately gave her a contract. After Zhang Miaomiao got the contract, she called me secretly so that I can fetch the contract. I was busy at the time and so I held back my joy: "Since they gave the contract to you, they cannot take it back. You keep it safe." This <Part-time service worker labor agreement> stated clearly that the hourly wage was four RMB. After two months of undercover investigation, the report appeared in the newspaper on March 28. On the day before, I called McDonald's and KFC to ask for their reactions. McDonald's gave a written response on March 28 to say that McDonald's labor practice is completely consistent with Chinese law. On March 29, Pepsi group's Guangzhou marketing department manager Cui Huanming agreed to be interviewed. We made an appointment. When I got there in the afternoon, he was not present. His secretary called him. He said that he had an outside meeting, but he will return soon. I drank two cups of coffee and waited for almost two hours before I finally saw manager Cui. He is a man who is in his 40's. I went straight at him: "Should your wages follow the Chinese Labor Law?" "Our contracts say so," he said. "Do your workers follow a full-time or part-time system? Which regulations in the law do you follow?" "It is neither full-time nor part-time. It is a special form of worker employment," he replied. "In what way is it special?" "That is not up to us to decide. We obey the Chinese law." He insisted that this is legal and they follow the law. He also said that the minimum wage standard in the part-time worker system for Guangdong is not applicable to their part-time employees. This was quite surprising to me. A part-time university student is neither full-time nor part-time employee. So their labor contact status is undefined. Therefore, the wage for students cannot rely on the nationally regulated part-time minimum wage standard as the basis. "So our entire investigation is worthless?" I was prepared to risk all my personal assets in the event that McDonald's and KFC sue me. But what happened next reassured me. On the afternoon of March 29, a male university student called me. After our report appeared, KFC required all workers to sign news contracts whose contents are different from the old ones. I asked him to meet me at the newspaper office. At around 5pm, he came with another male student. He said that on the afternoon of March 29, he went back to the restaurant for something. As soon as he walked through the door, the manager spotted him and gave him two pieces of paper to sign. This was a new labor contract, which stipulated that "it was not within the scope of the Labor Law but under the Civil Law code currently under revision." The original contact stipulated that "both sides sign in accordance with the Labor Law and other existing laws, regulations and related requirements." The signing was backdated to January 2, 2007. Apart from the new contract, I also obtained four different KFC contracts from the past eight years. A woman who had worked there for the past eight years sent them to me. This woman is 43-years-old. She claimed to have been laid off from her previous job and her husband had died from cancer. She worked at KFC and earned 4.7 RMB per hour. At first, KFC told her to sign a full-time contract. Then they wanted her to sign a part-time contact. This woman worked at least seven hours per day. She had never taken Lunar New Year off in eight years. However, she is coming up to ten years of employment and KFC does not intend to renew the contract with her. According to the law, any employee who works for ten years cannot be dismissed. This woman was in tears: "KFC claims to have helped so many impoverished students and hardship cases in China. I am a single mother and I need this job to feed my family. On the last week at the end of my eighth year contract, I received a rating of 100 for my work. Now they are saying that I am too old and they won't renew my contract." The following account came from undercover reporter Bu Fan (卜凡). I am the only proper reporter who went undercover for the newspaper. I have already graduated. On February 6, I went to apply for a job at Pizza Hut. I visited five Pizza Hut locations to fill out applications. On the morning of February 11, I received notice to interview at the Bainaohui Pizza Hut. I was interviewed by the assistant manager, who was curious about my status. On my application, I wrote: "Already graduated, but about to go for graduate studies." Previously, Pizza Hut said that they will not hire graduates. So I claimed that I was about to start graduate studies. "Our salary here is not high," the assistant manager went over these aspects repeatedly. After I said that I was sure that I wanted to come, he suddenly asked: "Do you think that you are overweight?" "No. As long as I am healthy. People have different standards for being thin or obese!" From start to finish, I kept a smile on. Perhaps that was why he thought I was suitable for the job. I was then put on trial for four hours. Afterwards, I was hired. The health certificate took one week to obtain. I bought a fake student identification. Apart from the student identification, everything that I provided was genuine. The reason why I obtained fake student identification was the last thing that the assistant manager told me. He said that I could obtain a relevant identification without their knowledge. In retrospect, Pizza Hut is quite rigorous in their hiring of current university students. But I appeared to match their requirements, and that was why he told me that. On March 7, the manager had me sign a contract. The contract did not state the hourly wage and it did not state the start date. I signed in the blank space and then the contract was taken away, supposedly to be stamped. "Do I get the contract after it is stamped?" "No." "Why?" They told me that when workers leave the company, the contracts have to be returned to the company. The company was afraid that we might lose the contracts, so they are keeping them safe for us. Until I left, I never saw the contract again. We want to get a contract, but we did not get it. This is also news. There was no contract, no wage card and not even a card for the working hours. There was no way for me to complain. After the first report appeared on March 28, our three reporters went to the Guangdong provincial labor and social security departments to file reports. We identified ourselves and the director in charge of receiving the media said that they had to follow procedures. There has to be a complaint first after which a case file is established for investigation. I happened to be one of the principals. According to the regulations, I had to state: my name, address, contact telephone number; the name of the relevant unit being reported, name of the person in charge, telephone number, address, postal code. I also had to provide the operating permit of the relevant unit being reported. Where was I going to find that? The receiving person also said that after the application has been filled out, the supervisory department will take one week to respond to the complainant about whether a case file will be established. If a case file is established, the investigation will not have results for at least 30 days and it could be as long as 60 days under some special circumstances. If I were an ordinary university student coming to file a complaint, it could take a few months and maybe nothing will result. I was very angry. After going through this step, we spoke to the provincial labor protection bureau office director Zhang. At our insistence, he informed the bureau's deputy director. At around noon, the deputy director in charge called in to ask that the case be handled with special case. On that afternoon, the relevant department called a meeting. That was how the Guangdong provincial labor supervisory department entered to investigate this matter. McDonald's and KFC seeking to resolve Chinese minimum wage issue. Associated Press via International Herald Tribune. April 5, 2007.